Smartphone and mobile devices are taking over the world. There are roughly 5.3 billion mobile subscribers, which equates to 77 percent of the world population. In addition, the widespread deployment of these devices within enterprises is on the rise and managing the complexity of the mobile ecosystem is a growing IT challenge. How do companies prioritize the management and security of their mobile infrastructure to address the increasing use of employee devices in the workplace? This session will discuss how IT departments, from global Fortune 1000 organizations to small businesses, can successfully deploy, manage and secure their growing catalogue of enterprise mobile across Apple iOS and Android smartphones and tablets. 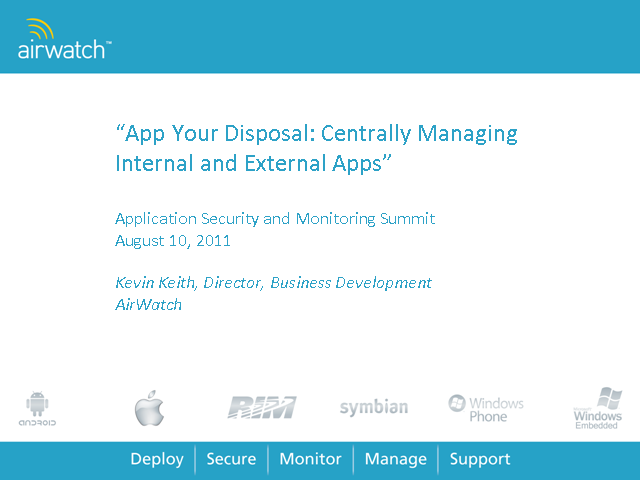 Attendees will also learn how to link applications for deployment to specific device groups, roles or users; roll out and manage a self-service portal where device users can select and install apps; and develop policies that can restrict access within the app catalogue at the individual user level or by any IT-defined groups. Strategies and best practices on achieving and maintaining internal and external compliance within enterprise app catalogues as well as tracking and reporting on app downloads, usage, updates and more will also be discussed. •What best practices must be in place to achieve and maintain compliance within an enterprise app catalogue.